Fact. There aren't many grindcore bands who have lead singers artists who are in their late-60s, but that's because there's basically only one Grindmother - and that's this 67 year-old Canadian mom. And she rocks. It was by total chance that she came upon her newfound and unlikely career in grindcore music. Her son Rain Forest asked her to do guest vocals on the tracks for his grindcore band Corrupt Leaders and a video of her screaming down the mic went viral—and the rest as they say is history. Now Grindmother has her first album out. Therein lies the beauty of the internet. 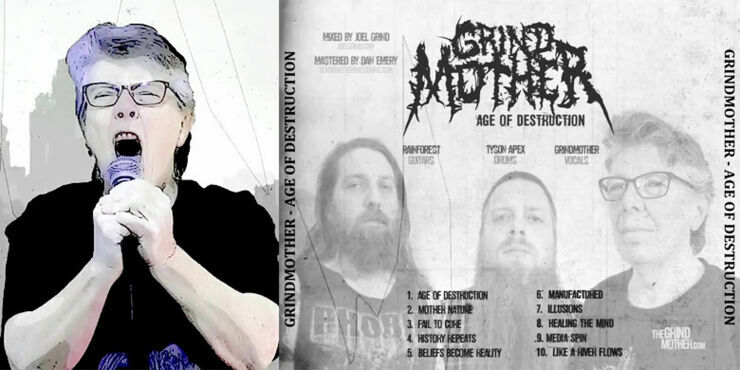 As far ad grindcore bands go "Metal history is made today," says Forest, "as 67 year-old Canadian grindcore artist Grindmother releases her debut album, Age of Destruction." The band features Forest on guitar, Tyson Apex on drums, and Grindmother on ear-shattering vocals. You can listen to a track from the album above called "Mother Nature" where Grindmother - the queen mother of grindcore bands - roars about environmental disaster and respecting the earth. Below Grindmother herself talks about Age of Destruction, explaining that she wrote the lyrics herself and that it's been quite the adventure for her so far. As one YouTube commentator says, "All hail the Grind Mother!" 67 Year-Old GRINDMOTHER Discusses Her Debut Album "Age of Destruction"